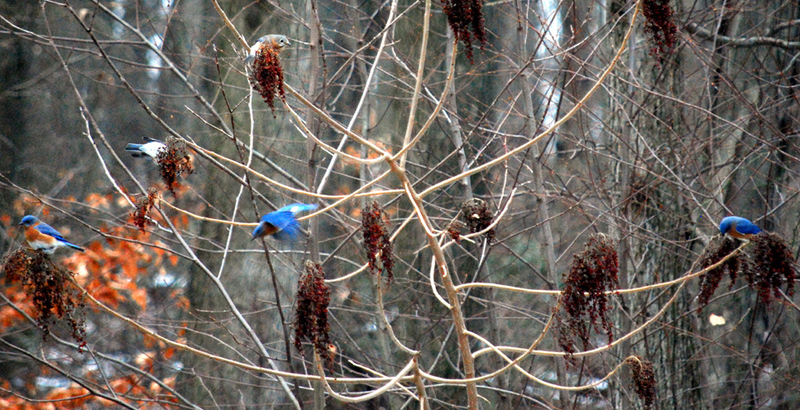 We were surprised to see a little flock of bluebirds through the kitchen window. What a rare treat. They alighted on the sumac seeds. They must have been very hungry as I think they greatly prefer creepy crawly things. 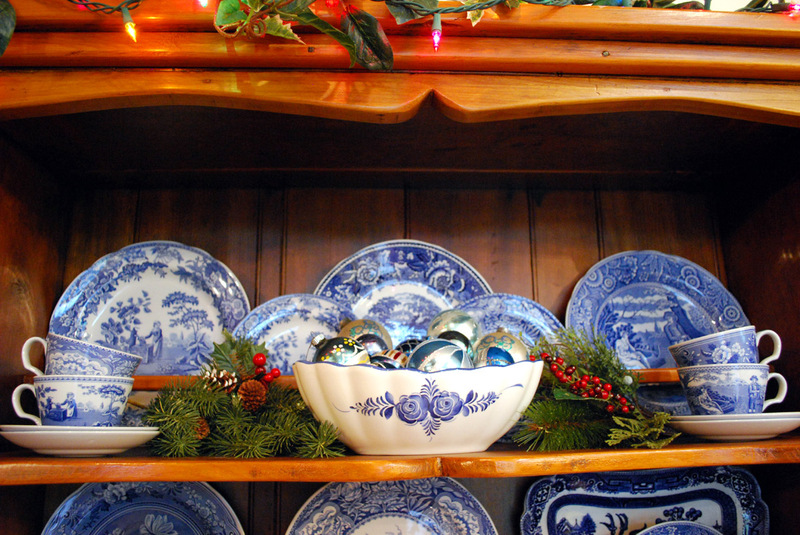 By a sudden quirk of holiday humor I decided to place blue Christmas tree bulbs in a bowl on the cupboard. I believe our visiting bluebirds are to blame for this impulse. A thrift store find also made its way into my decorating. Standing in the shop, the first reaction I had upon seeing it, was to identify with the hours that had gone into stitching it. I paid the embarrassing low price and took it home. Later, as I was falling asleep, pleasant thoughts of what to do with this pillow cover were like visions of sugar-plums dancing in my head. Hmm, it has plenty of red and green for the Christmas season, I thought. But something bothered me about it. It was the border. I didn't care for it, I realized. The blue squares seemed to be a design flaw. I can cut it away, was my conclusion. I'll make it round and add red pipping. 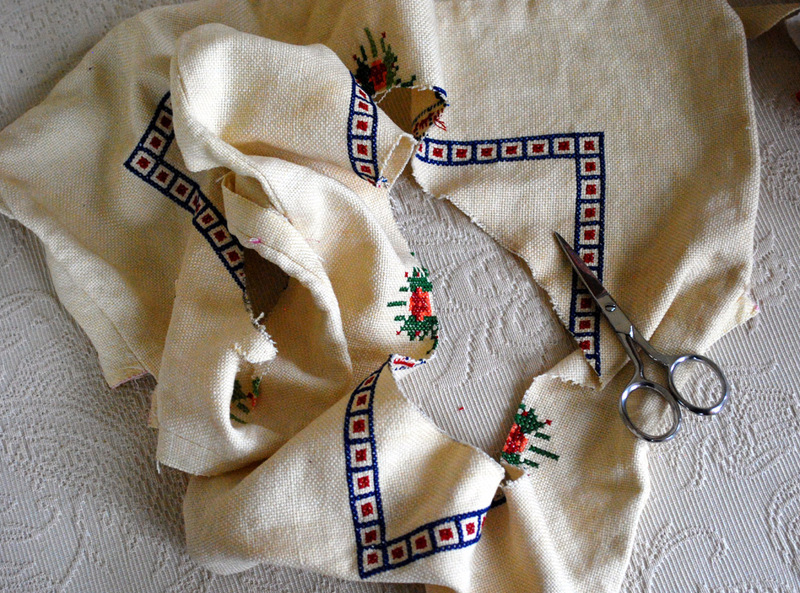 It was quite some time before I got around to washing the dust of years out of it, cutting it up and sewing it up. Just as I put my hand to my anticipated task, tracing a circle onto it, I got a telephone call. It made me tremble. My 3 year-old grandson fell. He crushed a finger. His mother drove him to the hospital emergency. "Please pray that he won't lose the tip of his finger," I was asked, "The doctor warned of the possibility." "Yes," I said shakily. 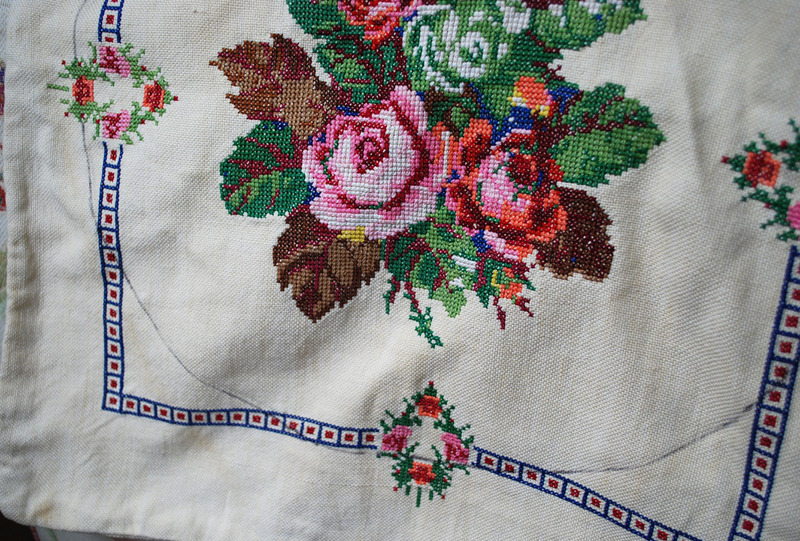 I sewed and prayed. After surgery and nine hours later, he was home with a brightly colored bandage around his saved finger. "He's doing fine," was the call I had hoped for. Mom and Dad were exhausted. His aunt (my other daughter) took over by reading him bedtime stories. 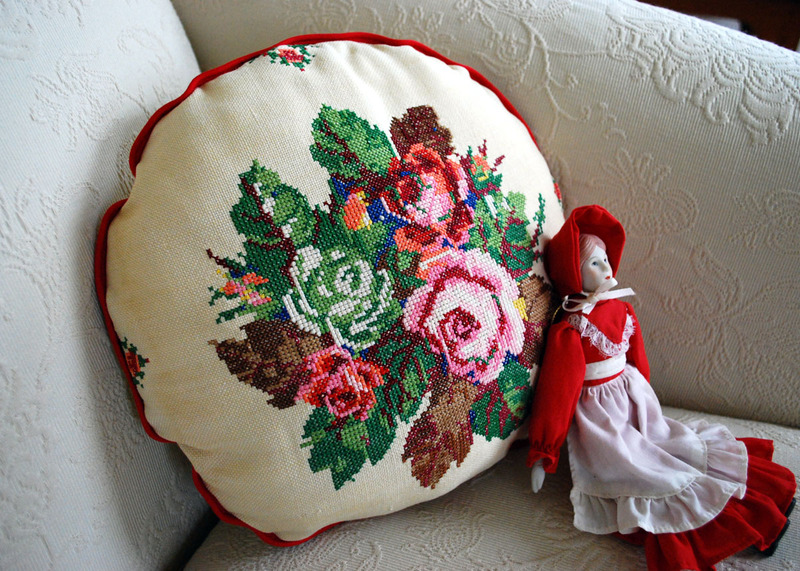 The Christmas rose pillow will probably always bring to my mind our answered prayer. 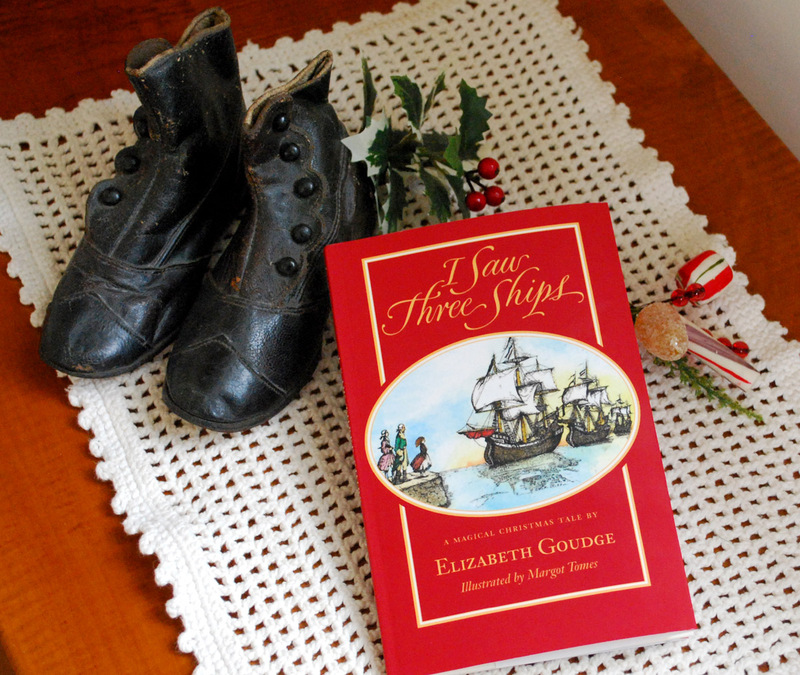 Early in December I ordered a short story from Amazon, I Saw Three Ships by Elizabeth Goudge. My name was put on a waiting list. It took a week for the book to come. When it did I read all 60 pages in one evening. Although most of the days this month have been heavily clouded and gray, the story brightened my soul. Now I'm reading it aloud to someone I love. The black and white illustrations by Margot Tomes are a style that fit the time period with precision. It's the late 18th century. Young Polly lives in England in a seacoast town with her two maiden aunts. Both Polly's parents die before the story starts but Polly seems to be adjusting fine in her new and different surroundings. She is more used to the country, however. 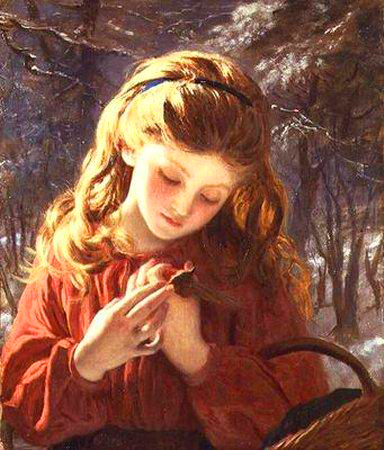 And she longs for certain Christmas tradition that was followed as she remembers it - in the country. That is - keeping the doors of the house unlocked so that the Three Wise Men can visit. These were the years before the popularity of Father Christmas. Polly stirs up hope and anticipation in her aunts who are rather set in their ways. And a bit anxious about their safety since their brother went away and their father died. They will not keep the doors unlocked on Christmas Eve. Absolutely not. They wouldn't want to tempt the undesirables from breaking-and-entering. Adamant, they tell Polly, "The only masculine protection in this house is your poor dear grandfather's Hat in the hall." The story made me smile. With its humor, yes, but also its demonstration of kindheartedness. The open window and the desire for unlocked doors in the story probably represent the characters' open minds and open hearts. And these are what permeate prayer, aren't they? Christmas is about miracles and long awaited answered prayer. There is a drummer boy, grown up and grown anciently old, in I Saw Three Ships. 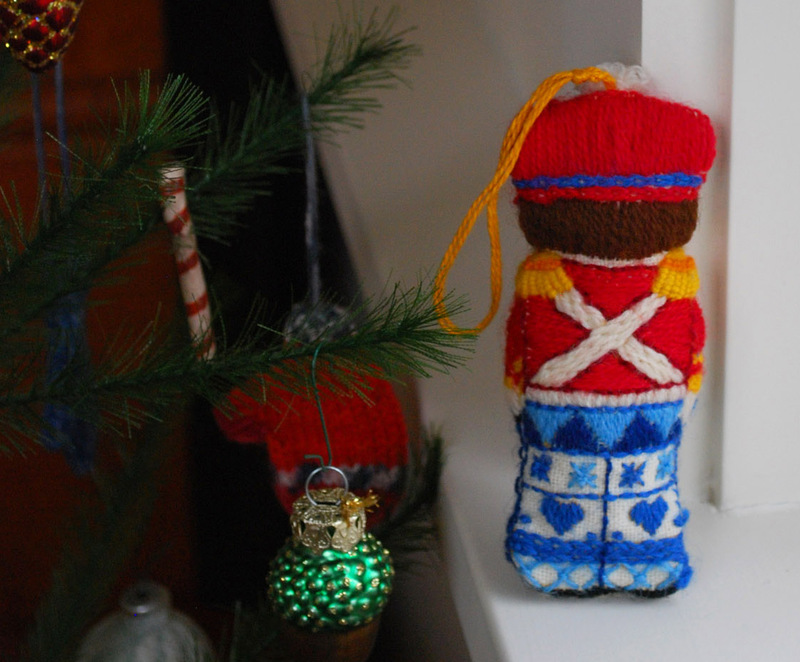 During my early years of married life I stitched a drummer boy ornament in crewel-wool from a kit. I got home from work before Dean did and remember clearly, sitting in a dark room, lit by one lamp and a single string of Christmas lights, head bent over my stitching while listening for his car in the drive. The the table mat under I Saw Three Ships is a crocheted gift from a caring blog reader. It happens to fit my tea table perfectly. Thank you. 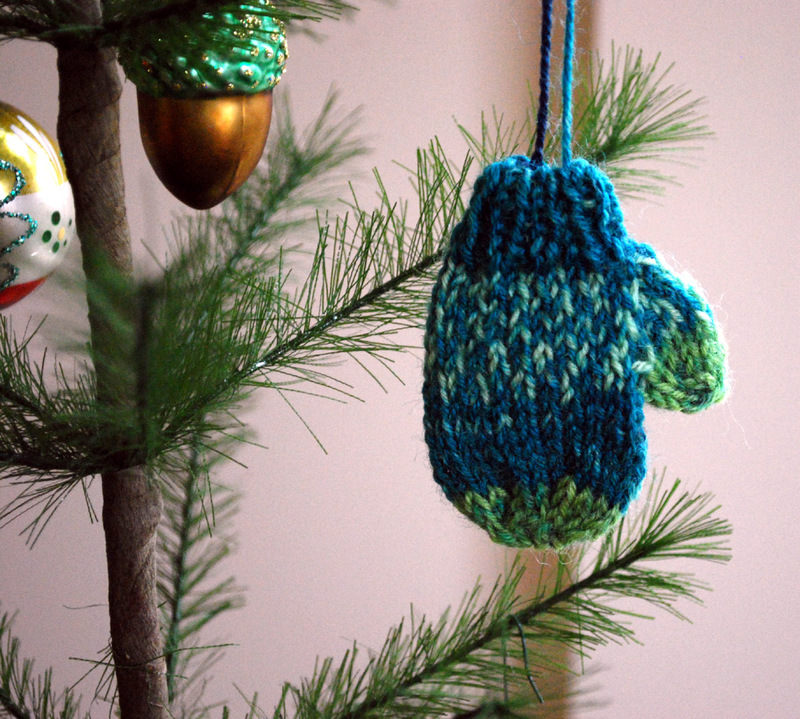 I knit the mini-mitten in sock yarn on size one needles. It hangs on the feather tree. You've probably already spotted on this blog, the child's well-worn antique shoes. I leave them out all year but somehow I like seeing them best among the Christmas greenery. 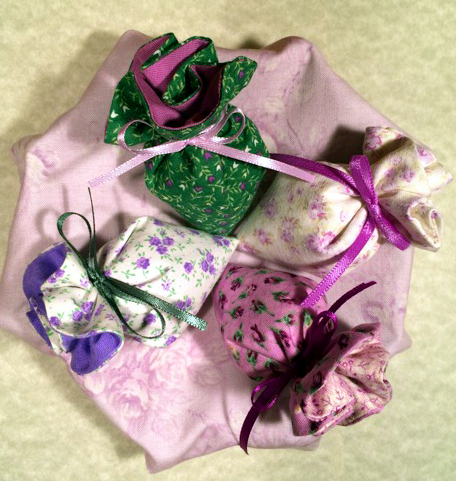 Blog friend, Lynne in Idaho, sent a photograph of her finished Lavender Strawberry Sachets. They turned out beautifully. I had forgotten the variety of fabric I had tucked in the kits in June. She would like to make Strawberry Sachets for gifts adding tiny glass beads. Thank you, Lynne, for sharing your photo. My readers are invited to share theirs. Our home business number is 717-786-6954. Or email: karenjandreola@gmail.com. Thank you dearly. 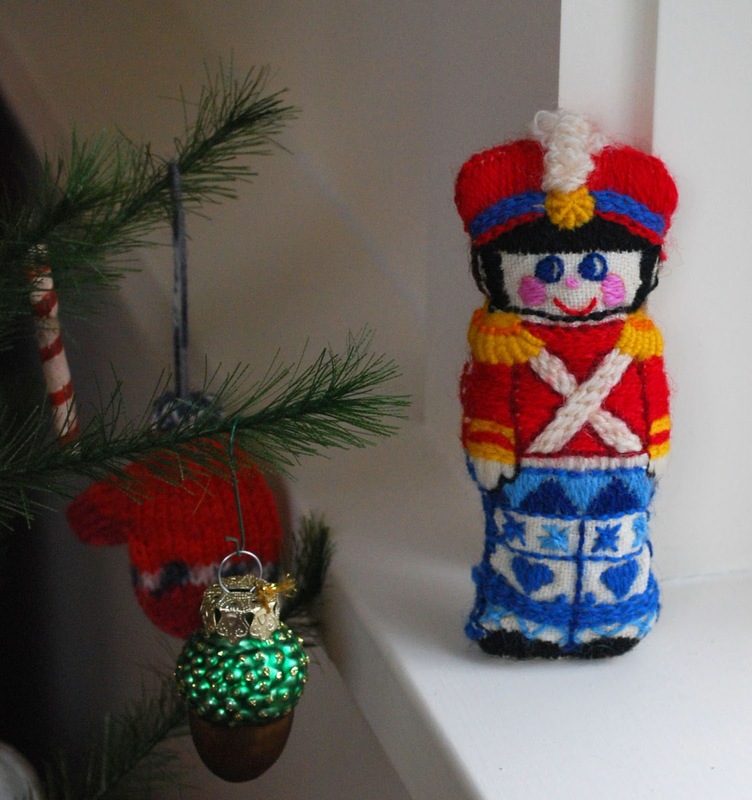 "I'll be home for Christmas, if only in my dreams." This old black and white photograph shows where my husband, Dean, started his life. The house is an iconic picture of an American home. It sits on West 7th Street in Plainfield, New Jersey on two-and-a-half acres, among streets of architecturally interesting Victorian houses both small and roomy - mostly roomy, built for the large Victorian families that once lived there. Plainfield was, in those days, a safe and beautiful place to live. And convenient. The train took its residence into New York City. The Gilbreths of Cheaper by the Dozen had lived in Plainfield, I believe. The house was Grandpa and Grandma's triumph. They worked and saved for years and years until they could afford to move out of the apartment above their hair-dresser's shop on Main Street. A large garden of vegetables, flowers and apple trees (in the photograph) beyond the archway, was tended with enthusiasm. Grandma and Grandpa lived on the first floor. Dean lived on the second floor, that was made into an apartment for his parents. 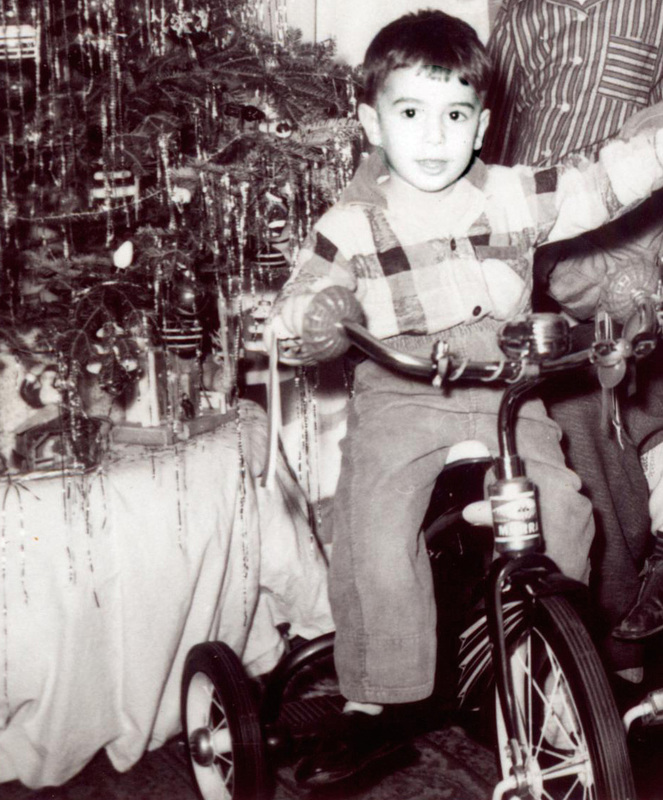 Another old photograph is of Dean on Christmas Day happily sitting astride a new tricycle. He has fond memories of wheeling round and round the paved circle driveway at the back this house. 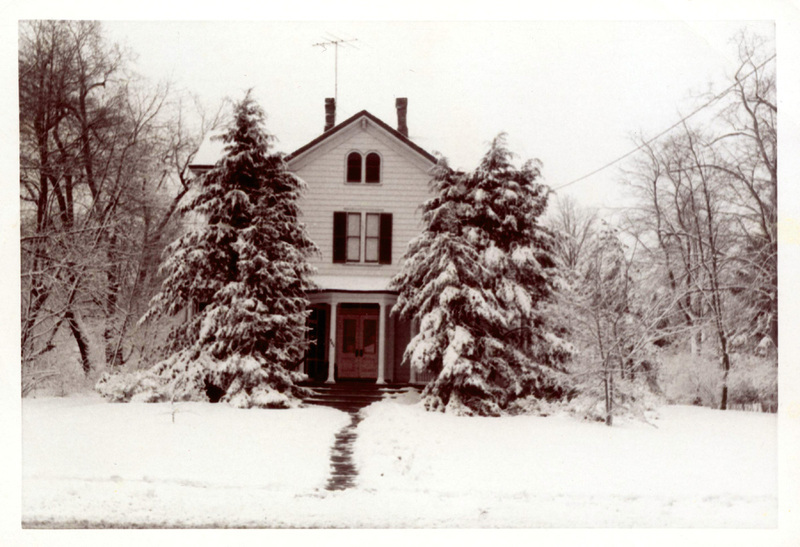 The ideal picture of a warm, secure, loving home seems never more in the forefront of our minds than at Christmastime. Moms and dads who experienced homes without secure relationships, warm togetherness and a strong faith in God, have had to start from scratch with their own families. Some of these people are my friends. I have had the privilege of meeting them in the various places where I've lived. They hold my esteem. I sympathize with their endeavors to create the kind of loving home that they wished they had had when young. Call it parental neglect, preoccupation, laziness, ignorance, or what you will. It can be a depressing thought - a lonely thought - perhaps even a loneliness akin to the childhood of Ebenezer Scrooge. Yet it is past. And carrying a grudge is the heaviest burden to carry. Looking to God, rather, who authors and finishes our faith, moms and dads set their sites to creating the kind of home that fills their dreams and follows their convictions. I've seen such a home sought after and elaborately described in the life of homeschooling families. I've seen it laid out detail by detail. It is worked out day by day, hour by hour. The result is a new creation, an honest-to-goodness happy home where family members work together, learn together, play together and worship together. Yes, there is need for the unpleasant correction of immature, or selfish, thoughtless acts among the children. This a necessary part of a labor of love. And sometimes we moms and dads need to say we're sorry, too. Overall, such families are a light to an ailing society (and the extended family). Oh, if society would only care to take a good look. At the heart of a person is the longing for home. This is especially felt at Christmastime. Such yearnings for love are really a yearning for God and heaven. A warm and secure earthly home is the next best thing. It points to God and heaven. He is not far away but is near to anyone who seeks Him. I unpacked some DVDs from my Christmas closet. 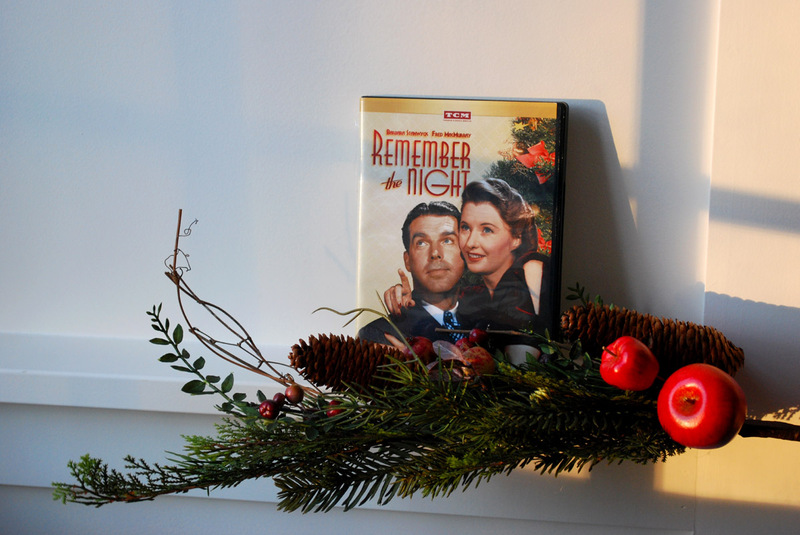 With hours of extra holiday cooking, decorating, gift wrapping, etc., it is nice to relax with a Christmas film. In the next paragraphs I talk about two stories that reveal a deep longing for home, love, and family togetherness. The scripts are a mix of humor and pathos. Therefore, I recommend keeping the tissue box nearby. "Prancer" is a family film that has plenty of crunchy mid-western snow. It is a beautiful story. 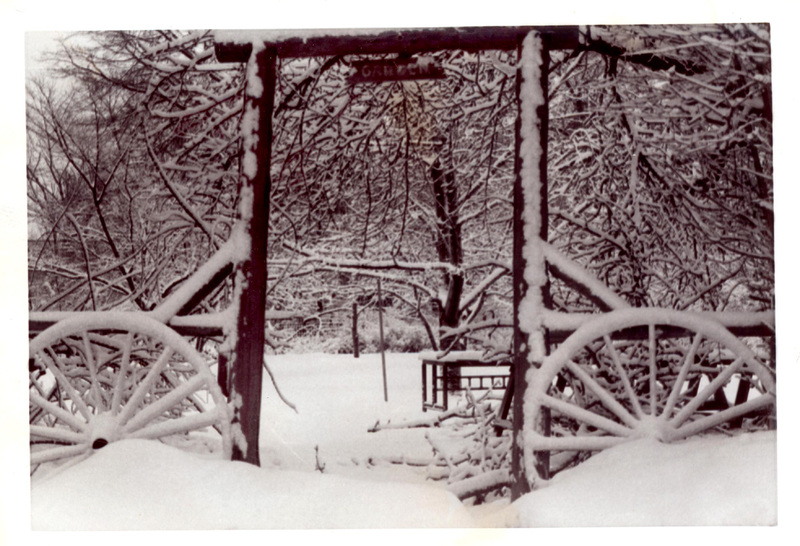 Dean photographed my DVD on a snowy bush out our back door. 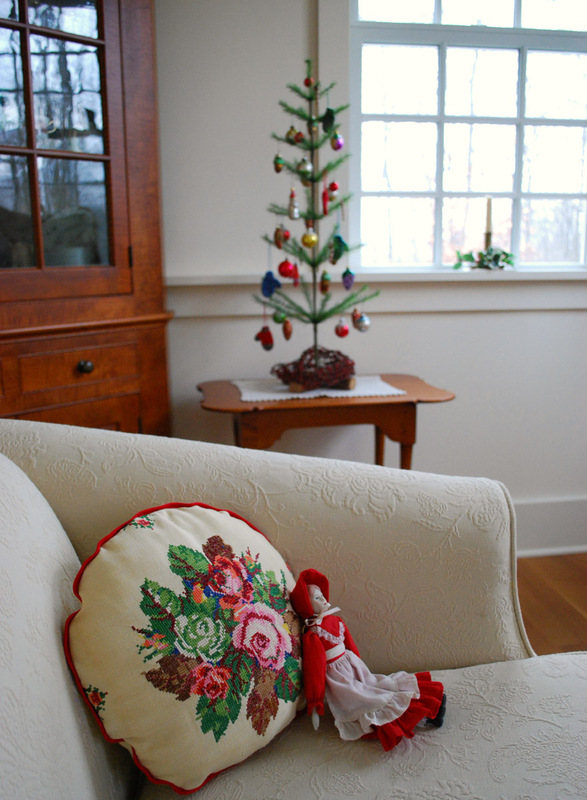 Cute-as-pie and something of a Pollyanna, eight-year-old Jessica Riggs loves Christmas. Her mother loved Christmas, too. 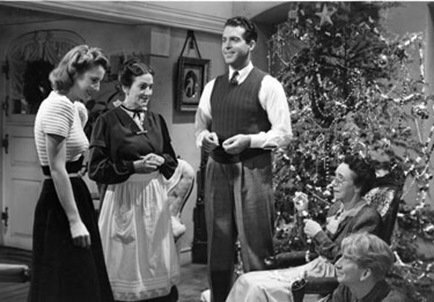 But Jessica's mother dies during the year (before the opening of the film) and the family is left to cope without her. Dad has difficulty managing the homestead without his lovely wife (the homemaker). He is sullen in his grieving, understandably. But his dark-cloud-of-an-outlook makes him gruff and impatient. Jessica soothes herself with Christmas hopes and joys. She clings (for dear life) to her faith in the unseen world. There has to be a Santa (who is unseen). There has to be a God (who is unseen) and a heaven (that is unseen). Otherwise, in Jessica's words to her doubting friend, "Where's my mother, then?" We click with the Christian overtones in this film, the church service of sorts, and a Christmas hymns sung reverently by its characters. The story, although placed in a realistic setting, has a conflict resolution that incorporates fantasy. Its theme also speaks of holding onto - or reviving - one's faith, hope, and love. On a snowy night Jessica discovers an injured reindeer who wanders through the woods onto the farm. She coaxes the hungry, hurt animal into a shed with Christmas cookies and in the morning skips school to search for the vet. She begs him to help her and also keep the reindeer, she believes to be Santa's Prancer, a secret, at least for a few days. The vet removes a bullet from the reindeer's leg and Jessica tries to nurse the deer back to health. She doesn't want anyone to discover Prancer, especially her father who she thinks would probably shoot it. She must think of a way to get Prancer back to Santa in time for Christmas Eve. Meanwhile she overhears her father talking about her. He thinks his daughter might be better raised by an aunt. The idea of being sent away from home and separated from her father is distressing. The acting is excellent and played by some well-knowns. Faith, hope and love make things happen in this film. I think this is one reason you will enjoy it. I love the ending. The film "Remember the Night" is for grown ups. My DVD was a Christmas present to me last year. I must have let slip out how I liked this unusual love story. Released in 1940 in black and white, the (too skinny) Barbara Stanwyck and gentlemanly Fred MacMurray give a convincing performance. But I can't figure out why it is titled "Remember the Night." Never mind. Miss Leander is a fashionable shoplifter. It is how she survives living alone "respectfully" in New York City. Caught stealing a jeweled bracelet she is arrested. Her court trial is to be continued and held over Christmas. The handsome attorney Mr. Sargent, is to blame for the postponement. He wants to head out of town straightaway to spend the holiday week with his mother in Indiana. But when confronted by his guilty conscience he bails Miss Leander out of jail, admitting to himself that his clever move in court would result in the young lady spending Christmas behind bars. An unforeseen circumstance throws them together. And when Mr. Sargent discovers that they are both from Indiana the idea crosses his mind to invite Miss Leander to join him in going west. This way, she may go home for Christmas and see her mother on the way to Mr. Sargent going home for Christmas to see his. "Home" is the thing to notice. The main characters were brought up in strikingly different homes. Both families were poor (probably having their beginnings in the Great Depression). But only Mr. Sargent had loving discipline, patient understanding, and forgiveness. It is the kind of home that Miss Leander always wanted. There is nothing overtly Christian about this Christmas classic. The characters may just as well be agnostics. 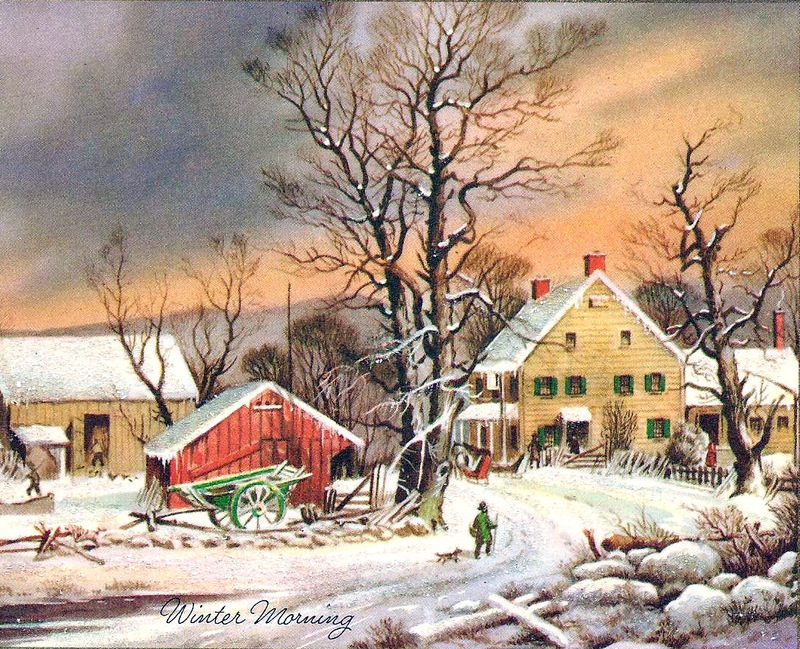 The songs sung around the piano are of the blessings of home, and are sweet but strangely do not celebrate Christmas. Nevertheless, these friendly characters have a moral conscience that is uncommon today. Standards of "right and wrong" are even important to the plot. Where these standards originate is a mystery. Christian viewers, however, can appreciate the film because we are apt to fill in the blanks nicely to our own bias satisfaction. We can do what we want with the background of a story, can't we? Perhaps the couple do not exemplify tip-top form (the very fact that they travel alone together). Yet, there is no hanky-panky, just tears and kisses, nothing more. It is the far-sighted and far-reaching value of home, with its honest and unselfish characters, that go into making this a touching film. 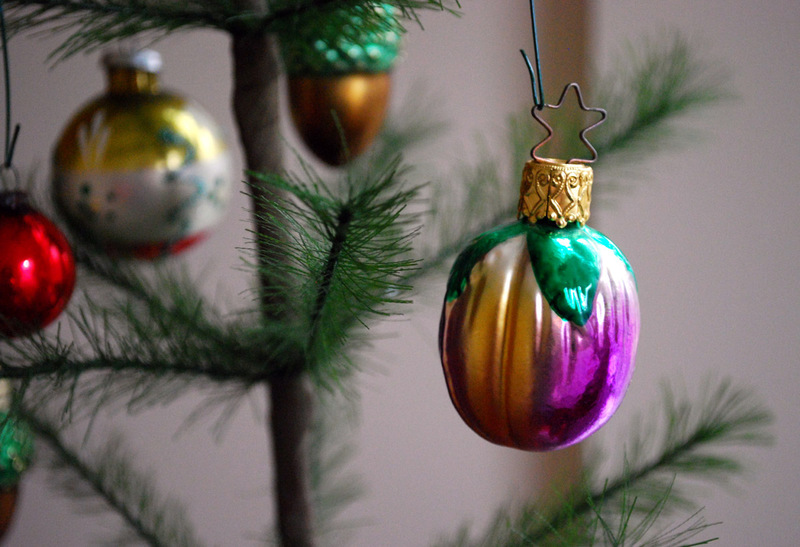 Decorating is behind schedule in our house. I'm taking my time and telling myself that this is okay. But it is a good feeling knowing my homemade gifts got their finishing touches with my needle on the first of the month, were wrapped and mailed. And the Christmas cards are sent. It is joy to be hearing and singing Christmas carols again. My blog friend Martina, who lives in Germany, sent me a photograph of her Lavender Strawberry Sachets. Aren't they cute? She told me that she opened her kit to sew them on a day that was "enveloped in fog and Mendelssohn." Thank you, Martina. I know my blog friends and I would like to see your finished Lavender Strawberries. I invite you to send a photograph to my email, karenjandreola@gmail.com. 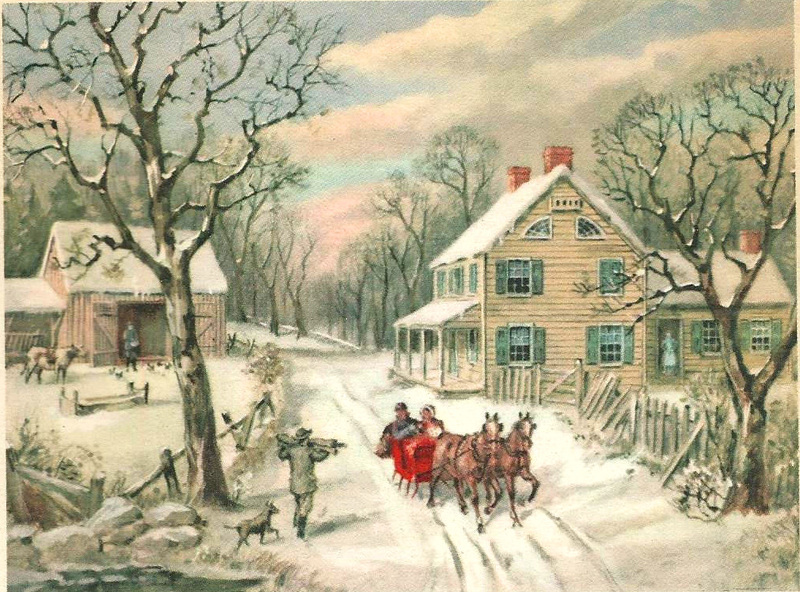 Paintings are by Courier and Ives.